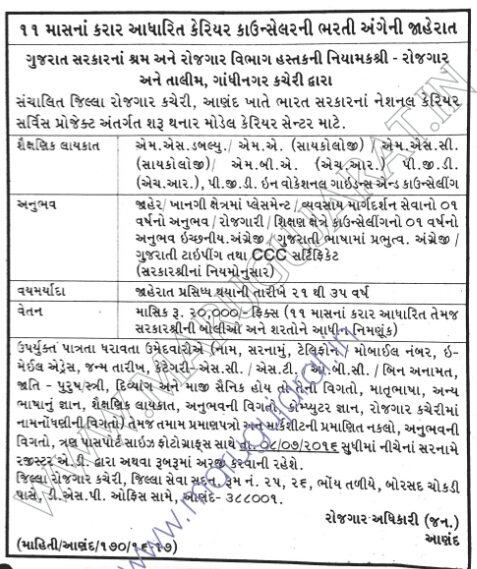 Home / Gujarat Jobs / Directorate of Employment & Training Labour & Employment Department Anand Recruitment 2016. Directorate of Employment & Training Labour & Employment Department Anand Recruitment 2016. Directorate of Employment & Training Labour & Employment Department Anand Recruitment Related All Info Given Below. - You Can Read All Details Carefully Given Below. Educational Qualification : M.S.W./ M.A. (Psychology) / M.S.C. (Psychology) / M.B.A. (H.R.) / P.G.D. (H.R.) / P.G.D. in Vocational Guidance and Counselling. Address to sent Applications : District Employment Office, Jilla Seva Sadan, Room No. 25, 26, Ground Floor, Nr. Borsad Chowkdi, Opp. D.S.P. Office, Anand - 388001. - Read Official Advertisement Given Below.